Since 2016, Flotec Industrial have been nominated twice for Innovation within Rail. This is because our revolutionary solutions have been proven to improve the reliability of Rolling Stock and provide “fit and forget” resolutions that engineers are looking for. By using the BlueStripe EPDM coolant hose (a hose with greater tensile strength than silicone) and the PowerGrip Clamp (a polymeric clamp uniquely qualified to prevent leakage after fitting) this pioneering product combination completely eliminates leaking hoses and significantly reduces downtime. With the support of both Angel Trains and Porterbrook, Flotec have been fitting the PowerGrip and BlueStripe coolant hose solution on Rolling Stock across the county. Flotec provide customers with a specialist site visit, to identify the current hose application, we then complete the improved installation with an optimised solution from start to finish. To find out more about this service, click here. This isn’t Flotec’s only secret to improving reliability of Rolling Stock. Poor routing and support are other factors that frequently lead to premature hose failure. Flotec offer a Hydrostatic Hose Optimisation Solution, working in collaboration with customer engineers, to understand existing installation history. We provide expert advice on ways to improve routing, create bespoke hose assemblies to customer requirements and again, complete the installation from start to finish. The products we use to upgrade these applications include the MegaCrimp C-insert Coupling, the only leak-free coupling on the market, and the MED-HT hose, which is a revolutionary, EN54454-2 fire approved hose. Above: Image of the MegaCrimp C-Insert Coupling and MED-HT Extreme Heat Hose. Flotec’s recommendations are incorporated into C4 maintenance programmes. On all future C4 exam works, the Flotec product is fitted with confidence and is warranted for exam cycles. Flotec also increase the reliability of Track Maintenance Machinery. 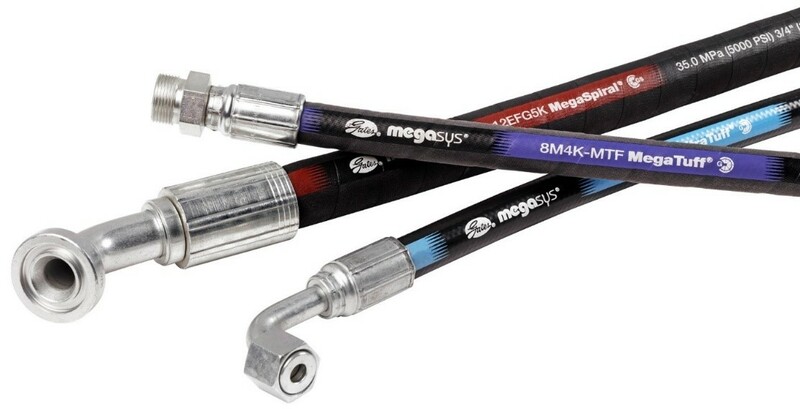 By utilising the Gates MegaTuff hose, we have developed an effective engineering solution that prevents hose failures on essential performance parts. Above: Image of Gates MegaTuff Hoses. Gates MegaTuff hoses are exceptionally resistant to abrasion. This is thanks to special cover construction and compounding that uses high-performance engineered plastics, in an innovative manufacturing process. The specially bonded cover stays put, it won’t peel, and the hose removes the need for costly hose protection. Our service for Track Maintenance Machinery doesn’t stop there. We further assist our customers with future planned maintenance activities, to deliver a long-lasting host maintenance strategy. For example, we offer fully pre-assembled hose kits for quick and easy installation. This, along with our safe hydraulics training, provides a significant decrease in maintenance, repair and overhaul costs. Click here to find out more about this service. Flotec Industrial will be at Railtex 2019, on stand D66. Make sure you come and talk to us about your Rolling Stock and how we can improve reliability.